A ‘targeted’ consultation on Guildford Borough Council’s Proposed Submission Local Plan (2017) began on Friday and runs to 12 noon on Monday 24 July 2017. 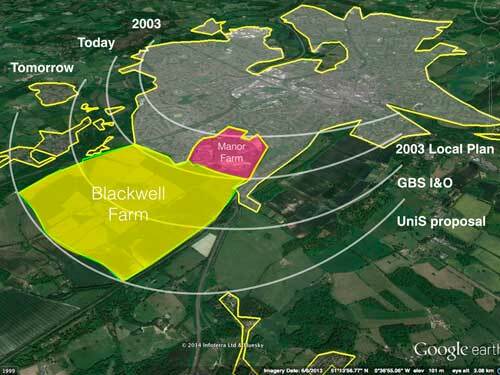 The draft Plan can be viewed on the Council’s website at www.guildford.gov.uk/newlocalplan, and the policy relating to Blackwell Farm (Policy A26) can be found on page 202. It is very important that everyone writes in to object to this proposal – even if it is just a couple of lines. The Planning Inspector will take into account public feeling when deciding whether this site should be developed, and we need to demonstrate that the people of Guildford want to save the Hog’s Back. You can email localplan@guildford.gov.uk or send a letter to: Planning Policy Team, Guildford Borough Council, Millmead House, Millmead, Guildford, GU2 4BB. You must clearly state that you “object” to Policy A26 (Blackwell Farm). You must include your full name and address. 4) adds to air pollution in neighbouring areas, which already exceeds safe EU limits for Nitrous Oxide [Policy A26]. Compton and Worplesdon Parish Council’s have jointly agreed to fund an addendum to the professional Technical Note, which identified problems with the proposed link road from the A31 to Egerton Road (which will form the sole access to the Blackwell Farm site). The addendum will look at the impact of this new road (and of the entire development) on the surrounding road network in the light of changes to the Local Plan. The planned new road will cross the Surrey Hills Area of Outstanding Natural Beauty, an Area of Great Landscape Value, and historic parkland. It will also pass through, or very close to, a belt of ancient woodland. Many thanks to the two parish councils for their contributions. “A review of the latest ONS population estimates and projections has found compelling evidence that there are substantial errors in past estimates of student migration flows. It is probable that migration flows out of Guildford, both to other parts of the UK and abroad, have been under-estimated by sizeable amounts. Please note that it is important to distinguish between a “demographic need” (births, deaths, migration), an adjusted need figure (which takes into account economic growth and affordability), and the “housing figure” used in the Local Plan (taking account of constraints and ambition). The GRA review is saying that it is a fundamental demographic building block that is wrong. 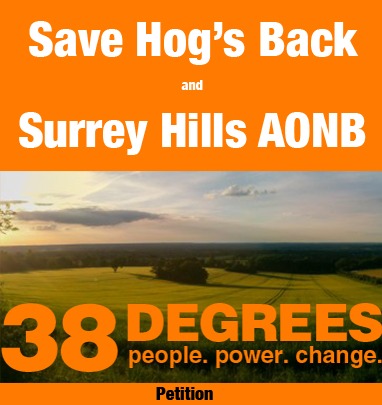 The London Green Belt Council (LGBC) has today issued a press release announcing its support for the Save Hogs Back campaign. This will distributed to the media on June 12. It will also promote the CPRE film featuring Blackwell Farm. A 30 second abridged version has been tweeted @savehogsback. Please could all those who use social media retweet this as widely as possible. The LGBC is also planning a Day of Action on behalf of Save Hogs Back. The date has yet to be confirmed, but it looks likely to be July 3. We will be looking for volunteers to help hand out leaflets at Guildford Railway Station and other strategic locations. In addition, we will be posting ‘consultation response’ postcards through letter boxes across Onslow Village, Wood Street Village, Park Barn, Compton, and the Hogs Back/Flexford area during the consultation period. Please let me know if you could spare some time to help. Many thanks to Graham and Lisa for their work in helping to boost the Save Hogs Back membership, and thanks also to our new members and all our existing members for their support. If any new members do not wish to be included in the blind-copied circulation list for these updates, please let me know. This entry was posted in Uncategorized on June 12, 2017 by tejstevens.